Omega Watches has quite the A-list of celebrity brand Ambassadors. Cindy Crawford, Nicole Kidman and George Clooney are big names with heavy pull and have been Omega Ambassadors for years and years. Omega has a great relationship with these celebs because they adhere well to the terms of their contracts and always show up for in-person store opening, new watch collection launches, etc. A few weeks ago it was Nicole Kidman who was in New York for an event at the Omega store and this past weekend it was Cindy Crawford who was strutting her stuff for a new collection of Omega women’s watches in London. Crawford has been an Omega ambassador since 1995, longer than any other of the company’s Ambassadors. Not only does she do advertising campaigns, she is also hosts events and participates in product design, lending her sense of fashion and model input to finishing touches and more. When the spotlight is on one of the world’s best known super models it’s hard to keep the conversation off of her and on the, in this case, watch that she is promoting, but Crawford did it by answering certain questions quickly and then returning the focus to the event. Conversation turned to her famous mole and how over the years it has grown bigger, prompting concern about cancer. When Crawford became a super model in the 1980’s her mole was the size of a freckle; it’s now larger and protrudes above the surface of the skin. 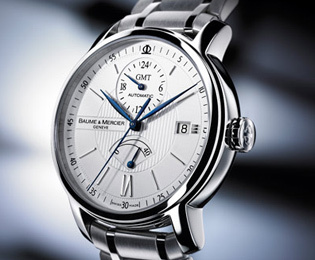 Baume & Mercier is a unique watch brand for many reasons, one being that they produce great looking watches that are well made but don’t cost a fortune. As with all luxury watch brands, B&M has suffered lower sales as well as a recent change in top-level management, but they continue on and with this perseverance come four new Classima Executive collection watches. Around since 1830, and with their mantra being: “Accept only perfection, only manufacture watches of the highest quality”, Baume Mercier watches remain some of the best ones out there today. These four new pieces are additions to the Classima Executive collection, whose claim to fame has always been that it flawlessly combines sophistication with classic touches, as seen in the details of each watch. Each of these new additions measures between 39 and 42 mm in diameter and all the cases are made from steel. The matching bracelets come with both brushed and polished steel to create a super smooth appearance. 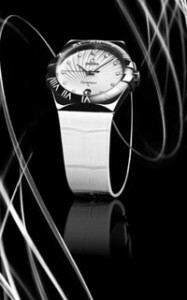 The silver colored dials are easy to read and with the steel case and bracelet offer an all-around very elegant look. The blue hands are done in blued steel and make for a cool contrast to the rest of the watch. Most versions come with some type of guilloche engraving decoration on the dial. Priced between what is likely to be around $1,000 – $3,000, Baume & Mercier gives you much more in a watch than most other brands do. With their high quality finishings, sapphire crystals and dressy, elegant look, these new Classima Executive watches are worth taking a serious look at. To celebrate its 125th anniversary, Breitling is launching a new, limited edition chronograph called the Cosmonaute. This version is based on the original Cosmonaute which was created in 1962 to accompany astronauts going to space. On May 24, 1962 this watch made its first trip to space when worn by Scott Carpenter. In space there can be confusion between day and night, so the Cosmonaute was created to be able to indicate all 24 hours of the day in a single sweep of the dial. Both Carpenter and his Breitling watch were successful in their mission. Only 1,000 of these new Cosmonaute watches will be produced. The collection maintains the original 24 hour dial feature as well as the design from the 1960’s. The bracelet is an Air Racer. Breitling watches are known as “instruments for professionals” because they were originally created for aviation pilots. However, as their chronograph features became envied, the watches achieved a certain status symbol among the general public. Many celebrities have become fans of Breitling watches, the Navitimer being the most favored by John Travolta (himself a licensed pilot), comedian Dave Chapelle, TV host Simon Cowell, musician Miles Davis, and actors Tommy Lee Jones and John Lovitz. 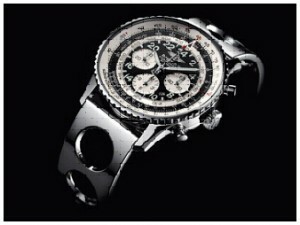 Rapper Ludacris prefers the Breitling Super Avenger. Using their capability to produce precise and elegant timepieces Breitling entered into a partnership with the Bentley Motors and born from that are four collections: the Bentley, the Bentley Flying B, the Bentley GMT and the Bentley Mark VI, all of which have some of the most exclusively crafted and luxurious watches ever produced. Almost all Breitling watches are men’s watches yet there is a small collection of women’s watches called the Windrider Starliner. At the young age of 25, Prince Harry is undoubtedly one of the world’s most eligible bachelors. He’s cute, he’s got class, he’s a bit of a bad boy and now, he’s got money and lots of it. Upon turning 25 years old on September 15, Prince Harry gained access to part of his late mother’s, Princess Diana’s, inheritance. Harry and his brother Prince William were left equal shares from Princess Diana’s estate following her death in a 1997 car crash in Paris. At that time, the shares were estimated to be about $10.6 million each, which has now been estimated to be about $46 million each. However, even with all this money and fame and constant media attention, Harry is as normal as they come. He dates, he makes mistakes, he voluntarily joined the British Army where he has become a lieutenant, and he wears a watch that any “ol bloke” could afford: the G Shock by Casio. The G Shock was designed to be an outdoor sports watch. It’s a tough watch, one that is shock resistant and can sustain the bumps and bruises of physical contact. All G-Shock watches have some kind of stopwatch feature, countdown timer, light and water resistance. As they’ve gained a somewhat celeb following, there are now some fancier styles. Other fans of the G Shock include musicians / producers Usher, Kayne West (who also likes Rolex watches), Pharrell Williams and football fav Brett Favre. 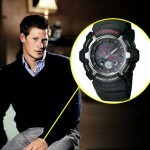 The G Shock has done well in Hollywood flicks as well, appearing on the wrist of Brad Pitt in “Mr. & Mrs. Smith” and on Steve Carell in the “The 40 Year Old Virgin”. Speaking of inheritance; Harry’s ability and desire to be “normal” very much comes from his mother. What people loved about Princess Diana was her ability to connect to people, which is why she was known as the “People’s Princess.” Her classic sense of style was much admired, and when it came to watches, she didn’t disappoint; she wore a Cartier Tank yellow gold watch with full bracelet, among other luxury watches that could only be fit for a Princess.